Q: What are the different radar detector bands? An older band, mostly used by automatic doors in supermarkets and rarely used by law enforcement anymore. You can eliminate this band by turning off X band in the menu. A potential radar strike that could also be a non-radar law enforcement. Know the area as many police still utilize this band. Alert! It’s the police. One of the most common used bands by law enforcement today. Alert! It’s the police. Higher law enforcement such as state troopers often use laser. Q: Are radar detectors allowed in my state? A: Radar detectors are currently banned in some states in the U.S. Enclosed is a list and link to American Auto Association AAA, which keeps an ongoing list of permitted states. ALABAMA — Radar detectors are permitted for passenger vehicles but prohibited for use by commercial vehicles. ALASKA — Radar detectors are permitted for passenger vehicles but prohibited for use by commercial vehicles. ARIZONA — Radar detectors are permitted for passenger vehicles but prohibited for use by commercial vehicles. ARKANSAS — Radar detectors are permitted for passenger vehicles but prohibited for use by commercial vehicles. CALIFORNIA — Radar detectors are permitted for passenger vehicles but prohibited for use by commercial vehicles. COLORADO — Radar detectors are permitted for passenger vehicles but prohibited for use by commercial vehicles. CONNECTICUT — Radar detectors are permitted for passenger vehicles but prohibited for use by commercial vehicles. DELAWARE — Radar detectors are permitted for passenger vehicles but prohibited for use by commercial vehicles. DISTRICT OF COLUMBIA — Radar detectors are not permitted. FLORIDA — Radar detectors are permitted for passenger vehicles but prohibited for use by commercial vehicles. GEORGIA — Radar detectors are permitted for passenger vehicles but prohibited for use by commercial vehicles. HAWAII — Radar detectors are permitted for passenger vehicles but prohibited for use by commercial vehicles. IDAHO — Radar detectors are permitted for passenger vehicles but prohibited for use by commercial vehicles. ILLINOIS — Radar detectors are permitted for passenger vehicles but prohibited for use by commercial vehicles. INDIANA — Radar detectors are permitted for passenger vehicles but prohibited for use by commercial vehicles. IOWA — Radar detectors are permitted for passenger vehicles but prohibited for use by commercial vehicles. KANSAS — Radar detectors are permitted for passenger vehicles but prohibited for use by commercial vehicles. KENTUCKY — Radar detectors are permitted for passenger vehicles but prohibited for use by commercial vehicles. LOUISIANA — Radar detectors are permitted for passenger vehicles but prohibited for use by commercial vehicles. MAINE — Radar detectors are permitted for passenger vehicles but prohibited for use by commercial vehicles. MARYLAND — Radar detectors are permitted for passenger vehicles but prohibited for use by commercial vehicles. MASSACHUSETTS — Radar detectors are permitted for passenger vehicles but prohibited for use by commercial vehicles. MICHIGAN — Radar detectors are permitted for passenger vehicles but prohibited for use by commercial vehicles. MINNESOTA — Radar detectors are permitted for passenger vehicles but prohibited for use by commercial vehicles. MISSISSIPPI — Radar detectors are permitted for passenger vehicles but prohibited for use by commercial vehicles. MISSOURI — Radar detectors are permitted for passenger vehicles but prohibited for use by commercial vehicles. MONTANA — Radar detectors are permitted for passenger vehicles but prohibited for use by commercial vehicles. NEBRASKA — Radar detectors are permitted for passenger vehicles but prohibited for use by commercial vehicles. NEVADA — Detectors are permitted for passenger vehicles but prohibited for use by commercial vehicles. NEW HAMPSHIRE — Radar detectors are permitted for passenger vehicles but prohibited for use by commercial vehicles. NEW JERSEY — Radar detectors are permitted for passenger vehicles but prohibited for use by commercial vehicles. NEW MEXICO — Radar detectors are permitted for passenger vehicles but prohibited for use by commercial vehicles. NEW YORK — Radar detectors are permitted for passenger vehicles but prohibited for use by commercial vehicles. NORTH CAROLINA — Radar detectors are permitted for passenger vehicles but prohibited for use by commercial vehicles. NORTH DAKOTA — Radar detectors are permitted for passenger vehicles but prohibited for use by commercial vehicles. OHIO — Radar detectors are permitted for passenger vehicles but prohibited for use by commercial vehicles. OKLAHOMA — Radar detectors are permitted for passenger vehicles but prohibited for use by commercial vehicles. OREGON — Radar detectors are permitted but are prohibited for use by commercial vehicles. PENNSYLVANIA — Detectors are permitted for passenger vehicles, but prohibited for commercial vehicles. RHODE ISLAND — Radar detectors are permitted for passenger vehicles but prohibited for use by commercial vehicles. SOUTH CAROLINA — Radar detectors are permitted for passenger vehicles but prohibited for use by commercial vehicles. SOUTH DAKOTA — Detectors are permitted for passenger vehicles but prohibited for use by commercial vehicles. TENNESSEE — Detectors are permitted for passenger vehicles but prohibited for use by commercial vehicles. TEXAS — Radar detectors are permitted for passenger vehicles but prohibited for use by commercial vehicles. UTAH — Radar detectors are permitted for passenger vehicles but prohibited for use by commercial vehicles. VERMONT — Radar detectors are permitted for passenger vehicles but prohibited for use by commercial vehicles. VIRGINIA — Detectors are not permitted. WASHINGTON — Radar detectors are permitted for passenger vehicles but prohibited for use by commercial vehicles. WEST VIRGINIA — Radar detectors are permitted for passenger vehicles but prohibited for use by commercial vehicles. WISCONSIN — detectors are permitted for passenger vehicles but prohibited for use by commercial vehicles. WYOMING — Radar detectors are permitted for passenger vehicles but prohibited for use by commercial vehicles. PUERTO RICO — Radar detectors are permitted for passenger vehicles but prohibited for use by commercial vehicles. Q: What is the difference between HIGHWAY and CITY mode? A: Radar detectors operate with various sensitivity levels. These levels determine the types of signals and signal ranges (bands) detected. Highway mode is the most sensitive level while City mode is the least sensitive. If the X band is left on in City mode, a radar detector can pick up many X band signals (such as garage door openers) that generate false alerts. 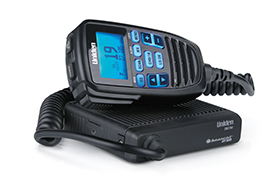 The DFR6 turns off the X band for City mode. When you are on the highway, there is less chance of picking up X band false alerts, so the DFR6 keeps the X band on. Q: My detector is alerting K band when no law enforcement is around. A: One thing radar detectors are competing against for newer cars are the safety sensors. Cars that emit collision avoidance, lane monitoring, stop monitoring and similar features can set off the K band on the radar detector. To solve this issue, you can set the K band filter to ON, but this will lessen the capability to notify you to true K band alerts. Warning – These updates are NOT for Australia/New Zealand models. After download tool is installed, run “Uniden R Series SW Download Tool V1.27” from newly created shortcut. Your version of firmware will appear on the application. Select the OPEN button and browse to the “R7_v122.123.111.db190402.bin” file from the previously extracted files, then select START DOWNLOAD. After update is complete, close the program. Firmware/Database/Voice is all updated with a single program now. After download tool is installed, run “Uniden R Series SW Download Tool V1.22” from newly created shortcut. Your version of firmware will appear on the application. Select the OPEN button and browse to the “R1_v148.207.000.bin” or “R3_v148.207.114.db190104.bin” file from the previously extracted files, then select START DOWNLOAD. Select the OPEN button and browse to the “R1_146.205.000.bin” or “R3_146.205.114.bin” file from the previously extracted files, then select START DOWNLOAD. Run Database Update Manager. The current version of Database will appear on the application. Browse and select the DB_20181004.bin file to update and start. When you have downloaded the zip file, extract the files, open up the folder, and then select DFR6FWUpdateManager. Connect DFR6 to PC with a USB cable and run Firmware Update Manager. The current version of Firmware or Database will appear on the application. Browse and select the DFR6RDAppv1.10E.bin file to update and start. Browse and select the DB_20170814.bin file to update and start. Select the OPEN button and browse to the “R1_v137.196.000.bin” or “R3_v137.196.112.bin” file from the previously extracted files, then select START DOWNLOAD. R3: Ka Mute memory bug fix: Users who use initial FW version(Ka mute memory firmware) might have Ka mute memory even they use the update FW because Ka mute memory is still stored in the memory. R3: GPS firmware update – sometimes failure occure during GPS DB update due to communication time problem between PC and product. We fixed this problem. R3: v1.37 firmware has the latest GPS DB. After download tool is installed, run “Uniden R Series SW Download Tool V1.16” from newly created shortcut. Your version of firmware will appear on the application. Select the OPEN button and browse to the “R1_v131.196.000_3.bin” or “R3_v131.196.110_3.bin” file from the previously extracted files, then select START DOWNLOAD. FOR R3 ONLY: There is no database update with this version, see previous updates. Run “R1_R3_VoiceUpdate_v1.31.exe”, press start, wait for completion. Select the OPEN button and browse to the “.bin” file from the previously extracted files, then select START DOWNLOAD. FOR R3 ONLY: Repeat process for Database update tool, open the “DB Download Tool.zip” file. FOR R3 ONLY: After download tool is installed, run “Uniden R Series DB Download Tool V1.11” from newly created shortcut. Your version of firmware will appear on the application. FOR R3 ONLY: Select the OPEN button and browse to the “DB_20170814.bin” file from the previously extracted files, then select START DOWNLOAD. FOR R3 ONLY: After update is complete, close the program. Run “VoiceUpdate.exe”, press start, wait for completion. After downloading, extract files and then open the “SW Download Tool.zip” file. After download tool is installed, run “Uniden R Series SW Download Tool V1.14” from newly created shortcut. Your version of firmware will appear on the application. Select the OPEN button and browse to the “R1_V126.192.000.bin” file from the previously extracted files, then select START DOWNLOAD. Select the OPEN button and browse to the “R3_V126.192.000.bin” file from the previously extracted files, then select START DOWNLOAD. Repeat process for Database update tool, open the “DB Download Tool.zip” file. After download tool is installed, run “Uniden R Series DB Download Tool V1.11” from newly created shortcut. Your version of firmware will appear on the application. Select the OPEN button and browse to the “R3_DB_20170405.bin” file from the previously extracted files, then select START DOWNLOAD. Download and install USB driver (CP210xVCP) to your PC. Download and install Firmware Update Manager. Browse and select the file to update and start. Download and install Firmware Update Manager (or Database Update Manager for Red light/Speed Camera Database update). When you have downloaded the zip file, extract the files, open up the folder, and then select DFR7FWUpdateManager. When you have downloaded the zip file, extract the files, open up the folder, and select DFR7DBUpdateManager (Updated 01/10/2017). Connect DFR7 to PC with a USB cable and run Firmware Update Manager (or Database Update Manager). The current version of Firmware or Database will appear on the application. When you have downloaded the zip file, extract the files, open up the folder, and then select LRD850_FWUpdateManager. Connect LRD850 to PC with a USB cable and run Firmware Update Manager. The current version of Firmware or Database will appear on the application. – Corrected misspelling of “Quiet Ride” on the right bottom of the display in “Quiet Ride” mode On. Previous firmware indicates “Quite Ride” on the display. Added K band Traffic Monitoring filter functions. – Laser software is updated to avoid laser false alarm that may be seen with some car models. CP210xVCPInstaller_x64 for 64-bit Operating Systems. When you have downloaded the zip file, extract the files, open up the folder, and then select LRD950_FWUpdateManager. Connect LRD950 to PC with a USB cable and run Firmware Update Manager (or Database Update Manager). The current version of Firmware or Database will appear on the application. Audio/Visual Alerts — The most common audio warning is a series of “beeps” or “braps” that grow faster as you near the radar source. Visible alarms can be either a digital display of signal strength or a series of LEDs. Many detectors now offer alphanumeric LEDs which can show you the type of band detected along with its strength. Auto-Muting — Replaces a continuous audio alert with a single alert followed by clicking. This can preserve your sanity during extended radar encounters while continuing to notify you of the presence of radar. City/Highway Switch (City/Highway Modes) — Helps eliminate false alarms from non-police X-band emissions encountered in urban areas, typically caused by automatic door openers at stores near the road. This is usually accomplished by reducing the detector’s sensitivity since the ability to “see” long distances is not critical on city streets. Some detectors feature multiple sensitivity settings for city driving. Dim/Dark Mode — For keeping the detector inconspicuous while driving at night, this feature dims or eliminates illumination on alarms and controls. GPS — Radar detectors with GPS technology don’t provide turn-by-turn navigation. Instead, they use GPS satellites to keep track of vehicle speed and provide warnings for when it exceeds a user-defined limit. They also allow the user to mark locations where there are known radar enforcement areas (“speed traps”), or where there are often false alerts, so the detector can either send a warning ahead of approaching those areas, or ignore the false alerts upon return visits. K-Band — The most frequently used radar frequency band: 24.05 – 24.25 GHz. K-band made its appearance in 1978. The first K-band hand-held radar guns could only be used from a stationary position. Later, a “pulsed” version was introduced that could be used from a stationary or moving vehicle. Ka-Band — 987 the FCC allocated a frequency on yet another band, Ka, for police radar use. Ka-Band incorporates Ka-Band, Ka Wide-Band, and Ka Super Wide-Band. With Ka came the introduction of photo radar (also known as “photo-cop”). The photo-cop system works at 34.3 GHz and combines a Ka-band radar gun with an automated camera (see Photo Radar below). The introduction of the “stalker” radar gun raised the stakes in the detection game. Unlike all previous guns, the Stalker can be FCC licensed for any frequency in the Ka-band between 33.4 GHz to 36.0 GHz, and so cannot be picked up by detectors designed only for X, K, and photo radar. Stalker guns are being used in more than half the country. Laser — Police laser uses laser light pulses rather than radar radio waves for speed detection. The laser speed gun has found its way into the hands of state and local police in at least half the country. Photo Radar (Photo Cop) — The photo-cop combines a Ka-band radar gun with an automated camera. A vehicle approaching at or above a predetermined speed will trigger the camera. The photo shows the front of the vehicle, license plate, driver’s face, the date, location, and time. The unit can clock and photograph up to 200 vehicles per hour. Alleged speeders are not stopped. The film is processed and a ticket is mailed to the registered owner of the vehicle, ordering him or her to pay the fine or appear in court. Photo cop’s effective range is 120-300 feet and it transmits a continuous signal, which is a plus for radar detectors. The distance at which it can be detected varies depending upon a detector’s Ka-band sensitivity. Better detectors can typically sniff out a photo-cop system 1/4 to 1/2 mile away. POP Mode — In POP mode, the DFR7 can detect short burst from radars that are too fast for many other detectors to catch. You can turn POP mode on and off in the Menu system. Pulse Radar — A refinement of the original K-band radar gun. Pulse radar can be used from a moving vehicle as well as from a stationary position. Pulse radar guns transmit a burst of energy every two seconds. Selectivity — A detector’s ability to detect police radar while ignoring the presence of such devices as automatic garage door openers and microwaves, which may operate on closely neighboring frequencies. 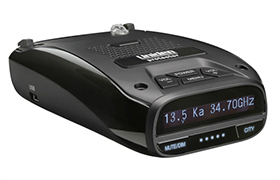 A good radar detector offers high selectivity as well as being highly sensitive. Sensitivity — A detector’s ability to detect radar. 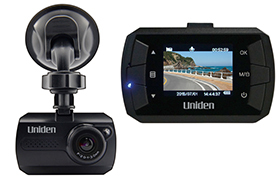 Most radar detector manufacturers increase sensitivity as they add features and move up the product line. “Stalker” Radar Gun — A hand-held, stationary radar gun that can be set to operate anywhere on the Ka-band between 33.4 and 36.0 GHz. Radar detectors must be able to scan a range of frequencies to detect it. These are referred to as Super Wide-Band Detectors — the latest generation of radar detectors specifically designed to pick up X, K, and the full range of Ka-band frequencies. Text Display — A text display spells out what form of speed detection you’re up against. VG-2/Spectre Radar Detector Detection (RDD) — You can think of VG-2 as law enforcement striking back against radar detectors. VG-2 identifies vehicles with operating radar detectors, by seeking out emitted frequencies from the tuning oscillators of radar detectors. Fortunately, most detectors provide some form of protection against this technology. Detectors with VG-2 immunity are shielded from VG-2 without interrupting radar and laser protection. Other detectors simply emit a warning and shut down automatically when they sniff out VG-2 signals. Visor Mount — Visor clips attach the detector to the sun visor. X-Band — The first frequency band allocated for police radar: 10.5 – 10.55 GHz. Dating from the 1950s, X-band radar is the easiest to detect because of its lower frequency and higher power output. Depending on terrain, temperature and humidity, X-band radar can be detected from a distance of 2 to 4 miles, yet it can only take accurate readings of speed from a distance of 1/2 mile or less.